Unfortunately, due to sales rights restrictions, we cannot offer Jour-J, Ce qu'on ne vous pas dit… for sale in your country. 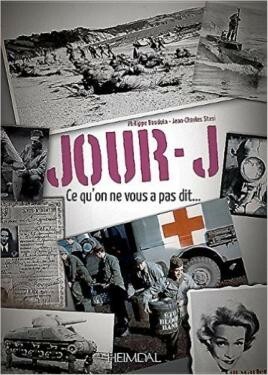 A major event of the Second World War, the landing of June 6, 1944 has been, for more than seventy years, the subject of countless books, films, surveys, reportages and TV series. Nowadays many are aware of the unprecedented technological achievements implied in the planning and construction of two artificial harbours, or of the heroic sacrifice of the Rangers under Lieutenant Colonel James Rudder's command, who stormed the Pointe du Hoc; or again of the martyrdom the of GIs of the 29th and 1st Divisions of the American infantry on Omaha Beach, which went down in history by the sad name of "Bloody Ohama ". But did you know that the D Day was preceded in late April 1944 by a similar event that took place off the Slapton Sands coast, in Devon, and that caused the death of more than seven hundred soldiers, yet remaining a secret for decades? Did you know that the beautiful Lily Sergeyev, artist and traveller, was considered by the Allies one of their best agents... and by the Germans as one of their most effective spies in Britain? Did you know that Lionel Crabb, sentinel diver of the Royal Navy on the Normandy coast, inspired Ian Fleming to create the character of James Jump? Did you know that the US troops, when completely surrounded in Mortain, were supplied with penicillin, morphine and plasma by dropping empty bomb shells stuffed with chocolate bars used as a cushion to avoid damages? Did you know that Lili Marlene, the Germans' favourite song, was also popular among Allied soldiers? These are only some of the original and instructive revelations you will find in this book, which is based on the rigorous research carried out in over half a century by Philippe Bauduin, who is passionate about the Landing and the Battle of Normandy since his childhood, and is author of a dozen books on the subject as well as numerous articles.